Alberta likes it when everything is big and exciting. When the other penguins make snowballs, Alberta makes one as large as she is. When the other penguins catch a fish, Alberta catches one ten times as big. When Alberta’s parents tell her she is going to be a big sister, she can’t wait but then she sees the two eggs in the nest. The eggs are rather small and insignificant looking, not Alberta’s style at all. Even worse, it is Alberta’s job to watch the nest while her mother is away. Can Alberta find a way to be excited about her new siblings? This simple story about a very enthusiastic penguin who likes life to be big and exciting will speak to toddlers and preschoolers who are welcoming a new baby into their family. Alberta celebrates the wonderful role of the ‘big sister’ while acknowledging that slowing down and taking on some older sibling responsibilities isn’t always appealing. 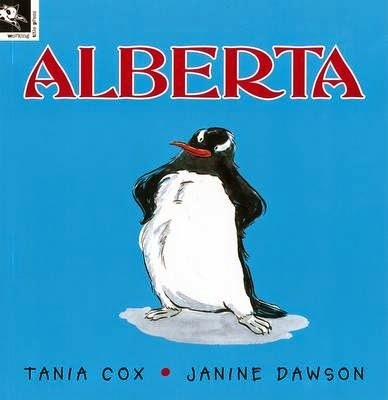 Tania Cox’s sweet story is perfectly complemented by Janine Dawson’s snowscapes and penguins. The colours are muted thanks to the setting, but Alberta’s larger than life personality shines through.